Sully is a captivating story - not about the landing- but about the man who landed the plane. Warner Bros. has been on fire this year with their blockbuster releases. Superb actors, scintillating trailers and fantastic marketing, all paired with up with amazing directors and storylines has really put Warner Bros. at the top of their game in 2016. Between Fantastic Beasts and Where to Find Them, The Legend of Tarzan, Batman v. Superman, and Suicide Squad, Warner Bros. has a knack for giving us stories about heroes in the most unexpected places and Sully is no different. On January 15, 2009, it was US Airways flight 1549 versus a huge flock of birds soon after take-off. Sully is the story of Captain Chesley "Sully" Sullenberger (Tom Hanks; Inferno), the veteran Captain of that US Airways flight who had the foresight to land his engineless plane in the Hudson River, saving all 155 souls on board. He also had the intelligence to realize that he was being informally tried by the National Transportation Safety Board (NTSB) for not operating the plane correctly, along with his co-pilot, Jeff Skiles (Aaron Eckhardt; London Has Fallen). The NTSB ran several simulations in which they believed proved that Sully made the wrong decision landing in the Hudson River. The computer sims believed that the Captain could have made it to several runways, landing safely. They also doubted that the left engine failed completely and kept questioning Sully if he really had no left engine thrust. All of a sudden, we realize- at almost the same moment Sully does- that he is the subject of a modern-day witch hunt. Clint Eastwood directed and produced Sully. Eastwood took the story of one man- a man who evaluated his circumstances in 208 seconds- in order to save 155 souls on board and told it to the world. A Captain who remained calm, despite the terrifying circumstances and whose only concern was for his passengers and crew, until he knew every last person was accounted for- and alive. A Captain, who despite being hailed a hero by all the passengers, crew, and media, was quietly being persecuted by the NTSB because they didn't believe him. Eastwood didn't tell the story of the heroic landing- Eastwood told the story of a man who was being hung out to dry by his own and who managed to use common sense to save himself and prove to the world that he was an honest to goodness hero. The movie replays the landing scene and events that led up to it several times throughout the movie for different reasons. I loved the flashbacks and the way that Eastwood piecemealed the story so that it wasn't told in a straight line. Despite that, the storyline flowed and it was easy to follow. Tom Hanks is articulate and has amazing depth when portraying the type of character that needed to make the whole movie. Aaron Eckhart acted as a co-pilot should- always a step behind but completely supportive in both his acting and his character. Laura Linney (The Nannie Diaries) plays Sully's wife, Lorraine, who is at home while Sully is thrown in the middle of the media circus and investigation. The audio is propelled by Dolby Atmos and for the first time in a while, I felt myself constantly reaching for the volume control. I would lower the volume when there was a scene involving the airplane and then have to bring it up again to hear the dialogue. Once I adjusted the volume, the sound was clear. If there was background music, it wasn't overpowering and honestly, pretty forgettable. The storyline was so intense that the focus was the verbal interactions of the characters rather than anything else. The 4k Ultra HD is 2160p with an aspect ratio of 2.4:1. The cover of the Blu-ray states "Features HDR High Dynamic Range- For Brighter, Deeper, More Lifelike Colors". There is no false advertisement, there. The 4K UHD resolution is outstanding. While I normally notice the colors more so with an animation, the clarity of details that can be seen is quite amazing. It's similar to the clarity difference we all saw when going from analog to HD in our homes. The 4K UHD is definitely a wow factor when deciding what version of the Blu-ray to purchase. I want to take a moment though and talk about the 1080p HD version on the other Blu-ray disc that comes with the 4K UHD package (and Digital HD version, also). 4K is a fairly new format with an extraordinary clarity in the presentation, and colors that I never imagined I would behold on a television set. However, that should not detract from the HD Blu-ray. Picture quality is still clear and crisp with the 1080p version and should not be overlooked. In addition, the Special Features are found only on the HD Blu-ray. Sully Sullenberger: The Man Behind The Miracle: Landing Flight 1549 on the Hudson is known as the "Miracle on the Hudson" for a reason- not only was the double engine failure due to bird unheard of before, but no one had landed in the Hudson River, successfully, before Captain Sully showed the world it was possible. Learn more about this extraordinary man who kept saying in the movie that he was "just going my job". Moment By Moment: Averting Disaster On the Hudson: Listen to Captain Sully, Co-Pilot Skiles, and Air Traffic Controller Harten as they walk us through the 208 seconds that could have ended in a completely different way if different decisions had been made. Neck Deep in the Hudson: Shooting Sully: Director Clint Eastwood and producers Frank Marshall and Allyn Steward take us behind the scenes and show us how they brought this Miracle landing to the big screen. Sully is a typical Tom Hanks movie - one in which it's about the character- not the story he is featured in. This seems to be a Tom Hanks niche and I am thankful that Eastwood had the foresight to cast such an actor. Hanks is such a diverse actor and he is so familiar to audiences that, despite the storyline being a little slow moving, Hanks draws you in just because he is who he is. A captivating story- not about the landing- but about the man who landed the plane. Despite some flaws, it's still an A rated movie. 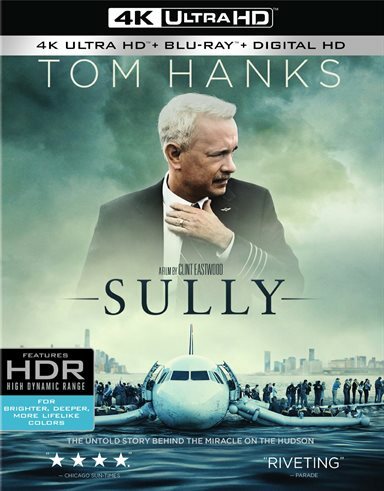 Download Sully from the iTunes Store in Digial HD. For more information about Sully visit the FlickDirect Movie Database.